Has technology replaced the need for business cards? In this day of smart mobile technology, you will most certainly have asked the question more than once “do I really need a business card at all?” With Linkedin, Bump and a great number of other mobile apps that let us share information about our businesses immediately with others – you are right to ask the question. Do your customers know your opening hours over Christmas? Keep your customers informed about your opening hours this Christmas by sending them an email that not only wishes them a Merry Christmas, but lets them know your opening hours over the holiday period. It’s a great way to ensure that you get a well earned break without having to worry about customers contacting you while you take a well earned break. Three Christmas Email Card Designs to choose from and three easy steps! Send us your business logo, customer email addresses and your Christmas opening hours. Leave the rest to Martlette! Order your Email Christmas Cards now! How to choose the best Graphic Designer in Geelong for you! Fear not, Martlette Graphic Design in Geelong have put together four simple factors to keep consider when making your selection for your perfect graphic designer. Good design requires both a good designer and a good client. The best way to choose the perfect graphic designer for you will always start with a strong understanding that even the most skilled designer may not deliver what you want if you have no idea what you want. However, that being said, there are many things you can, should and must ask before considering any designer for your job. Your graphic designer will need to know who your customers are, what they want and what they like. Your graphic design will need to know whether they are designing for print or web application and where you design will appear. Think about the result you want from the design. Do you want more customer enquiries or do you want make your visual brand more consistent? 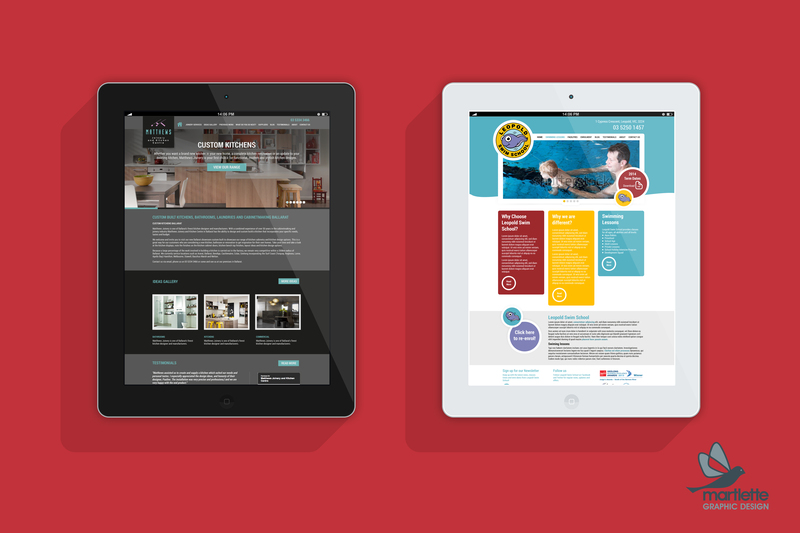 Should you be considering a responsive website? Take a look at your google analytics and check out how many of your website visitors are viewing your website on a mobile device (this includes mobile phones and tablets). You currently have a website for your business, but it’s important to understand who views your website and what device its viewed from. If more than 10% are looking at your site from a mobile or tablet, then it’s time to consider responsive website design (RWD). If your business already has a website or is considering one, you will know how many different website designs that are out there to take inspiration from. 2014 has already seen some outstanding websites emerge on the world-wide-web and at Martlette we have loved watching the trends in website graphic design unfold. Great website design plays an important role in creating a positive online experience for your online visitors. Having a website design that enhances user experience and provides an intuitive navigation will improve your results and ultimately have your website visitors contacting you. Below are the web design trends that we have seen rule 2014 so far.